I told them we must surrender all of ourselves to God, that we can’t hold anything back of ourselves. I reminded them of Ananias and Sapphira who as recorded in Acts chapter 5, held back a portion of their gain and they were each destroyed because of the deceit of it. There is deceit in holding any of ourselves back from God, in this same way we too will be destroyed, spiritually, physically, emotionally, mentally… when we do not surrender our whole heart. The people started coming up to where I was standing. One held out her arm and I saw that about 3 inches from the elbow had been amputated. I reached out and unraveled the sleeve of her shirt and took hold of the stump of her arm. Then I reached for her other arm which was whole and placed them against each other and began tracing a line from the amputated arm matching her whole arm and fingers, and then they appeared on her amputated arm. Both arms were now whole. Next was an older woman with rheumy looking eyes. I wet my fingertips with my own spit and rubbed them across her eyelids. When she opened her eyes, they were clear. She touched her face and cried out with joy. There were many that our Father touched. Many dropped to their knees and repented before God. There were tears, crying and sobbing as we were all faced with our own wretchedness. Yet healing came on so many levels. Suddenly a man was at the front of the sanctuary saying terrible things, blaspheming God, words I cannot and will not repeat. I told him to silence his tongue and repent, or surely the Lord would deal with him this very night. Two men from the church led him out of the sanctuary. So they all turned their backs to the man with the machine gun and I turned my back as well. Then a loud cacophony of sound erupted from that machine gun, but nothing touched us. It sounded as if the bullets were bouncing off something. 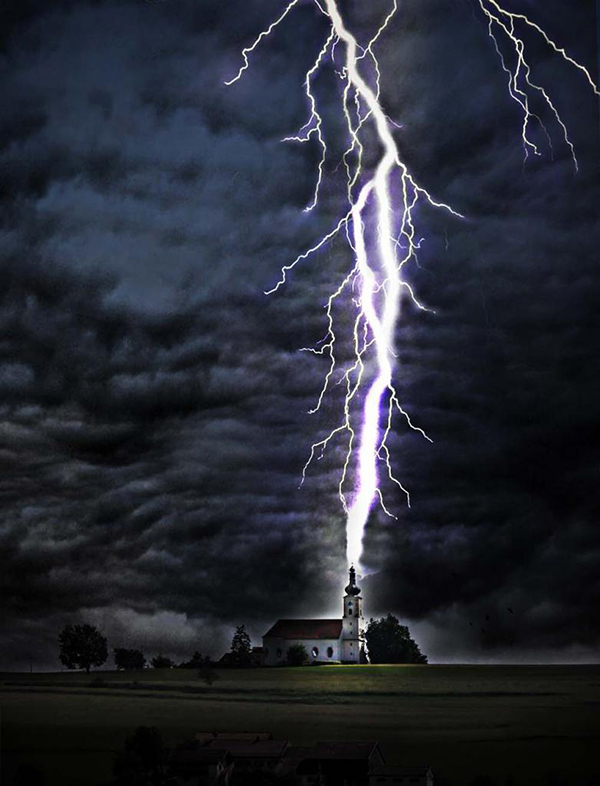 Then suddenly a loud crack of what appeared to be lightning came down through the roof of the sanctuary, our backs were still turned but the light and the sound was overwhelming. Then silence. I turned around and saw right behind me stood seven Messengers of God in what appeared to be full armor with shield and swords. They were tightly standing side by side and seemed to me to be 10 feet tall. There was a light around them, like a golden glow. I moved to step in between them, the ones to my right moved two steps over to allow me through. The man with the machine gun was laying dead on the sanctuary floor. I looked up and saw that a hole had been torn through the roof and ceiling of the sanctuary where the lightning bolt came through. Then I saw all the bullets lined up on the floor in front of the Messengers, they were flattened as if an anvil had smashed each one, all laying in a row. I realized those bullets hit the shields of the Messengers, protecting all of us standing behind them. I began sobbing again. Gently, a white light came through that hole and shone around me and I felt a huge teardrop land on my head. Our Father and I were crying together, for it is His heart that none should perish, yet we make that decision, whether to believe in Him who sent His Son and the Spirit of Truth to us. Then the light receded and my brothers, the Messengers seemed to turn into white light and went up through that same hole in the ceiling and were gone. I was worried about the damage, but shouldn’t have been. In the whole scheme of things, what did a roof matter after all? As I sat on my patio this morning, tears running down my face, the Holy Spirit of truth began speaking scripture to me. He was speaking the words Yeshua said in John 14:10-17. We who believe in Yeshua, who trust that His word is true, must walk in His power, in His courage and strength. This vision is for the Body of Yeshua. We are extensions and heirs of the King. That is just Wonderful Kasey Streichert Burt, i was reading and watching it like a movie in my mind…. For the kingdom of God is not in word, but in power. Awhile back, I wanted to read thru the new testament and catch all the red letter words, those being the words of Jesus himself. John 14 really came out and spoke to me “deeply” and I wept and had to read it again and again. I go to John 14 a lot now knowing that is our Lord and Savior talking to me too!! The book of John is red letter full of JESUS speaking. I am blessed by this vision/audience you had and shared here with the body of Christ. I also loved the humor you said about the ceiling. Even when we face mighty trials and burning tribulations and God brings us thru, it seems He always leaves us with a merry heart with laughter and joy IN HIM. We have victory in Jesus and we never walk away with our tail between our legs or our head hanging down. We walk away saying Glory Father in Heaven, the mighty to save!! I’m sitting here crying with you. I was thankful for the humor at the end. God bless you. He is so good. such a beautiful encouraging vision. Thank you. How amazing is our God? 💕This vision resonates strongly with me as I am focusing my energy on fully understanding and learning how to use & call upon God’s power that he bestows on us through our faith. Never learned how to do this as a Christian & given the days ahead, this seems to be a critical skill to learn now. Thank you Kasey. I appreciate the advice & will definitely assess my life against each of these. Many blessings to you & yours. 😘. I hope we will receive more of your Words here on Z3 News. Can someone please explain what the heart and mind and soul are so i have a better understanding? I couldn’t get the part where both the heart and mind are lost. The heart is often used interchangeably with the human spirit, which is our connection with the unseen spiritual realm. The mind is part of our soul, which connects us with the seen realm, the physical natural world around us, and with our spirit. Saying their heart is lost means their spirit is eternally lost in hell. Only God can see the hidden things in each of us, so only He can judge each of us correctly, but I believe people who have lost their mind have not necessarily lost their eternal life. James You are exactly right in your explanation. People who have lost their minds are not necessarily lost eternally. Yet, the one whose heart is lost at death is lost forever. I hold PhD’s in both Counseling Psychology and Clinical Christian Counseling, and totally concur with each of your comments and explanations above. You’re right, sometimes the heart is for God and the mind could be diseased and not be aware of what it is doing. I’ve not heard of you before Kasey, and on another subject altogether, and I love this story very much and I love to see women in ministry, that is ministering to women and mentoring them etc.. Scripture is very clear that in Yashua there is neither Jew nor Greek, slave or free, male or female etc.. but the role give to me isn’t the same as the role given to woman. Men don’t bare children, woman do, women don’t shepherd the people, men do, not because men are more spiritual or wiser but its the role given to men who have been set apart for the work of shep[herding His people. I see that the Scriptures only recognize men to be shepherds of the congregation. Timothy was told to appoint just men, men who are husbands of one wife etc… do you read that differently, ignore it? Paul also explains that the woman is subject to the husband, not because it was the culture of his day but because of what happened in the garden 4,000 years earlier, transcending his culture altogether. I’m not at all questioning your spiritual maturity but would love to hear what your view is pertaining to these Scriptures. Gregg W. Do not worry over this, I was not offended in any way. I appreciate what you have shared with me. We cannot limit a limitless God and at the end of the day, it is our Father I will ultimately answer to. Blessings to you and your family. Ok thank you so much. That clears a lot now.